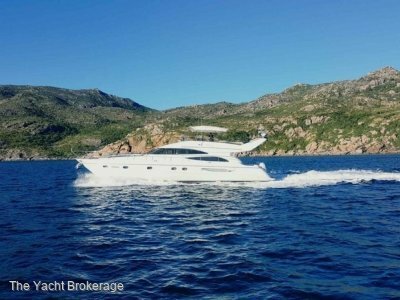 This vessel is outstanding for a 1995 Azimut and has been maintained to the highest standard. This vessel is the 35th boat from this mould. General layout: Forward is the chain locker accessed via a deck hatch and next aft is the crew's quarters aft of a watertight bulkhead. The crew's quarters has two single berths and ensuite head with shower fixture. Forward from the interior is the forward VIP guest cabin with centreline queen berth, hanging locker ensuite head, stall shower and ample storage cabinets. 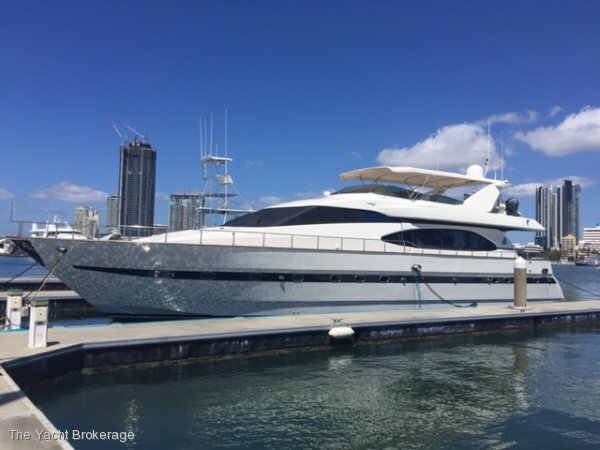 Next aft is the full width master stateroom, with king berth, large vanity, small settee, walk in hanging locker, full size ensuite head, stall shower and ample storage lockers for cruising. Up steps from the forward cabins to the pilothouse with centreline helm and raised bench seating aft. Next aft to port is the formal galley with port side door to the exterior. Opposite is the companion way to the dining and salon areas. There is a door to the starboard side deck in this area. Just aft of the galley is the dining areas with round table and seating for six. The main salon follows and has port and starboard curved settees. A stairwell to starboard leads to the two aft staterooms. Forward is the "Kids" stateroom with two single berths and ensuite head and stall shower. This stateroom is followed by the aft VIP cabin with centreline queen berth and ensuite head. The aft deck follows with bench seating aft and a high gloss varnish table. Port and starboard gates lead to down curved steps to the swim platform and lazarette entry. A ladder from the aft deck leads to the boat deck. 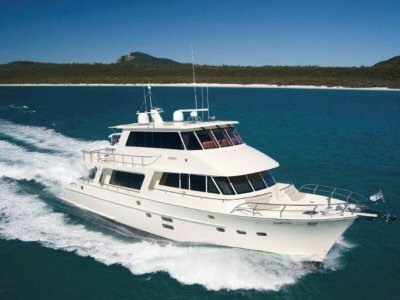 Above the galley is the flybridge with portside helm station followed an electric cook top and a large dinette. The boat deck follows the curved dinette. 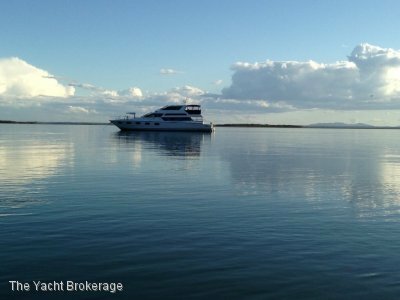 There is a new full bimini on the flybridge, one over the helm station and the other extend forward from the radar arch over the dinette. The engine room is located below the salon sole and accessed via a floor hatch just aft of the galley. The forward and aft bulkheads are full height and along with ceiling appear well insulated. 120 vac florescent lighting illuminates this area. The deck is plywood with an aluminium overlay. No dc voltage lighting is present. This area appears well maintained based on her age and arraignment. The bilges in need of cleaning and the addition of dc emergency lighting are suggested. Each main engine has its own raw water intake valve and sea strainer. Each one is fitted with an emergency bypass valve to operate as emergency bilge pumps for this area.